Aero India 2015 is lower in energy than ever. There are no big deals to announce, no big customers to woo. And that reflects in the energy at the show. On the show front, there is a larger presence of civilian aerobatic teams. The Flying Bulls aerobatic team, the Scandinavian Airshow and the Breitling Wingwalkers, and the Yakovlevs Airshow Aerobatic team. The only other aerobatic team is the Indian Airforce’s Sarang helicopter team. 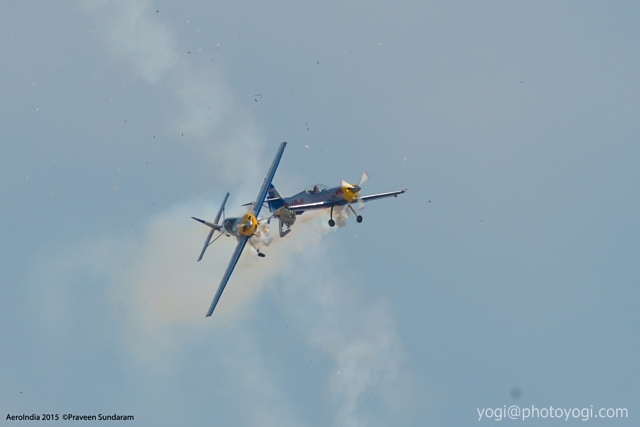 The Flying Bulls pulled out of the show after two of their aircraft collided mid-air, leading to prop damage to one and wing damage to the other. Incidentally, this was to have been the Flying Bulls’ last airshow on the Zlin 50XL aircraft, as these birds have reached the end of their airframe life. Civil aircraft on static display includes a Dassault Falcon 7X, Falcon 2000, Pilatus PC-12, Dornier 228NG, Sukhoi Superjet 100, Let L-410 Turbolet, and an Embraer Pheonom 300. Indoor presence is limited and low key. Original Equipment Manufacturers like UTC Aerospace have a modest stall, while a major airframer like Embraer have neither a stall nor a chalet. Dassault has a large stall, and that is only because of their optimistic outlook of the civilian and military Indian market.